DETAILS As you toss out those little baskets that held the strawberries you just ate, don't you think, hmm, that basket has untapped possibilities? Well it does and this Easter basket is just one of them. Fill it with whatever your imagination dictates, cookies, candies, Easter eggs or fragrant soaps. To begin, place the larger side of the basket on a piece of paper and draw around its shape. Do the same for the smaller side. Cut these out to use as templates. Place the template on the wrong side of the paper you are using to cover the basket, leaving enough room on the paper to outline a mirror image above it. Draw around the template. Lift the template and place it like a mirror image above your original shape. Draw around it. Cut it out and fold in half. This will cover one side of the basket, both inside and out as well as the basket rim. Do the same for the smaller side. You will need two small sides and two larger sides. 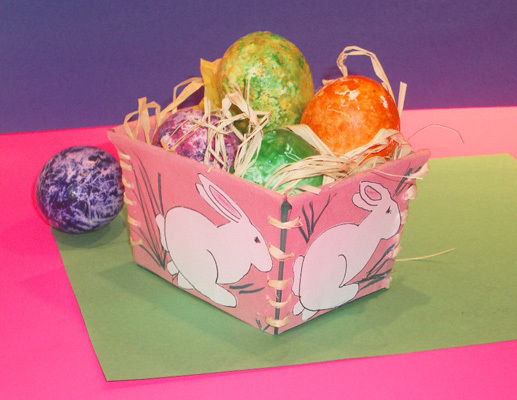 Draw around the bottom of the basket on the back of your decorative paper. Cut out all these pieces. Thread a wide eyed needle with sturdy raffia. Drop in one of your panels and whip stitch around the top of the basket poking your needle through the openings in the basket and through the paper. At the corner, add another panel and continue stitching all along the top edge until you've gone all the way round. Do the same on the side panels lacing them at the corners from top to bottom. When this is done, drop in the bottom piece, decorative side up. Fill with raffia, tissue paper or your choice of filling. Suggestions: use heavy paper, wrapping paper tends to tear during the stitching. Construction paper works well. For help on drawing easy Easter pictures for decorating your baskets, check our section on how to draw easy Easter pictures. Decorate before you attach your panels to the basket. If you want to use wrapping paper, glue it to construction paper to give it added strength. Adapted from Between Friends, craft projects to share by Charlotte Lyons. SKILLS NEEDED Ability to cut and sew. Click to add COMMENTS or a RATING for this activity.